If you’re in search of the best fishing charters Key West has to offer, you’re in the right place! You can never go wrong with Captain Moe’s Lucky Fleet. Our three well-maintained boats carry clients out to the deepest portions of the ocean, ensuring the catch of the day always lands at your feet. Whether you’re looking to do a little light fishing in the afternoon, backcountry fishing, or an all-day trip to snag some 10-foot sharks, we’re the charter you can trust to make this a memorable experience. So, are you ready for shark fishing, sail fishing, and more? Our fleet consists of three state-of-the-art boats, including The Lucky Charm, Reel Lucky, and Reel Lucky Too. The Lucky Charm – Our 42-ft custom Stapleton Sportfish is equipped with 3 custom-built fighting chairs, Penn rods and reels, a large cabin, and a cooler for your drinks and food. Reel Lucky – The 30-ft custom Proguide Dorado is the jewel of our fleet. She is one of the best fishing charters Key West offers. The boat features top-of-the-line rods and reels, custom shade tree, and a huge live well. Reel Lucky Too – Finally, we have the Reel Lucky Too. She’s a 26-ft Panga – the newest in our fleet – offering a comfortable ride, the best rods and reels, and conventional equipment for battling all manner of fish. Our crew consists of some of the best fishermen in Florida, including Captain Bill Bailey, Captain Teddy Baier, and First Mate Tommy Muskana. These men are all highly experienced boatmen and fishermen, allowing us to focus on your experience first and foremost. Contact Us for the Best Fishing Charters Key West Has! 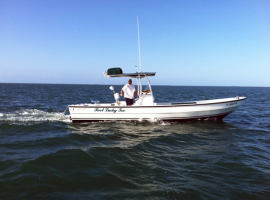 To hire the best fishing charters Key West has to offer, contact Captain Moe’s Lucky Fleet at 305-304-8065. We would be happy to bring you aboard and show you the ropes!